The waste management sub-sector is projected to add over 20,000 jobs between 2017 and 2024. Nowadays, there’s growing emphasis on waste reduction, environmental protection and sustainability, in private and public sectors, is driving a need for waste management services and expertise in this field. Duties and responsibilities of workers in the sub-sector involve dealing with hazardous and non-hazardous waste, and at the same time, developing environmental policy, guidelines and standards. Let’s learn more about occupations, skills that employers look for as well as salaries and key industries. Competencies and skills are also diverse. Employers require workers to know the policies and regulations that affect waste management while being able to apply and communicate them. 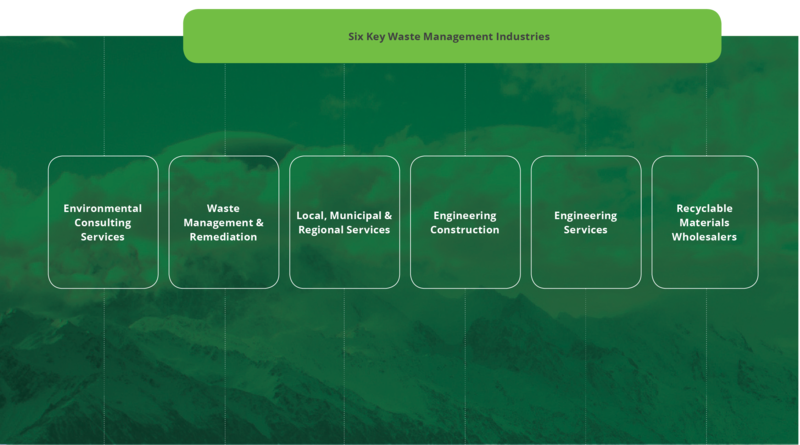 Other competencies involve developing and implementing waste management plans and programs, monitoring waste application, disposal, reduction programs and activities and collecting samples and data for environmental purposes. Surveyed employers also identified technical knowledge and skills that employees should develop: scientific aptitudes, which include environmental science, biology, geology and chemistry; skills in waste management and health and safety skills. Our report focuses on six key industries defined by the North American Industrial Classification System (NAICS). These industries were chosen because of their high concentration of workers who spend most of their time on waste management duties. A person who chooses a career in this sub-sector can expect an average starting salary of $45,290 and an average top salary of $73,168 according to data collected in 2015. The occupations with the highest average salaries belong to the management skill category or to professional, technical or skilled trades. 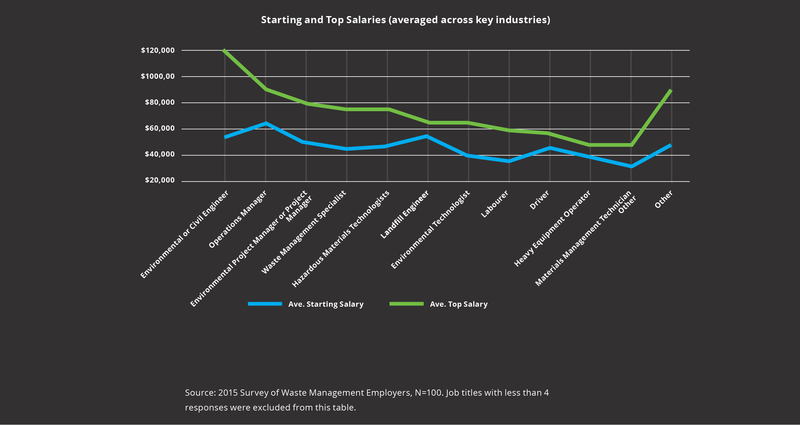 These are the ones that tend to have the highest variation between starting and top salaries. Environmental or civil engineers could see a 54% increase as they become more experienced. 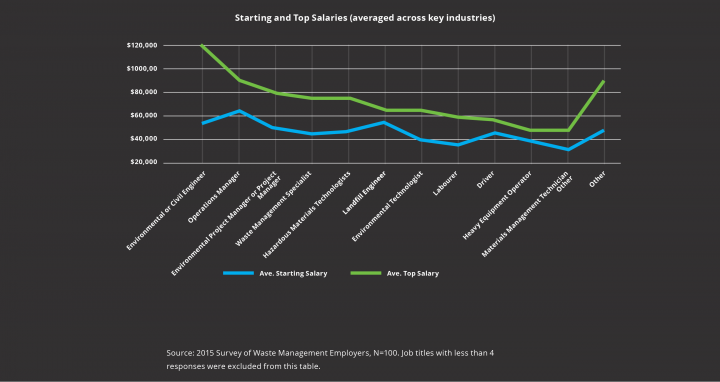 Learn more about career paths and trends in the Waste Management sub-sector in our report.